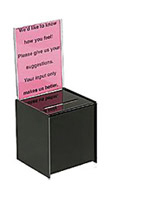 Are you shopping for an acrylic drop box to collect donations or employee suggestions? This clear container is the ideal solution. 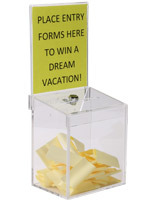 This entry box, acrylic ballot box is a nine inch cube enabling users to collect large number of entries or monies. Each container is made with high quality material that is durable and able to withstand years of use. 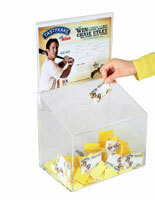 This suggestion holder, acrylic ballot box features a large sign frame that also acts as the back of the box. 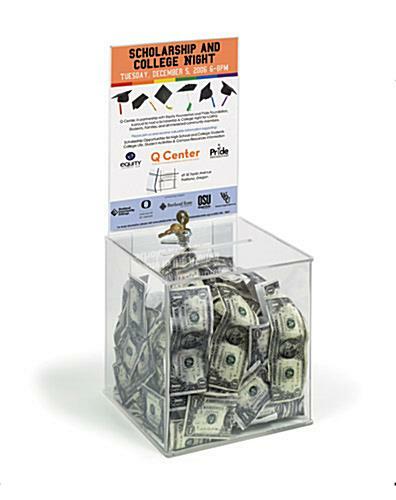 The signage holder is ideal for posting informative signage regarding a charity or contest rules. 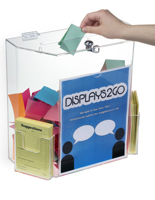 This acrylic ballot box with a header is easy to change out graphics without having to unlock the unit. The old image is slid out the side through the openings. 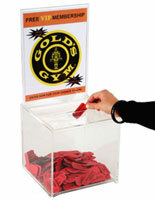 This acrylic ballot box has a key lock to keep the contents secure and control access. Each unit is shipped with two keys. Each acrylic ballot box has an 8.5" x 11" sign frame. Print your own message from your own computer, insert into header and change signage at a moments notice. 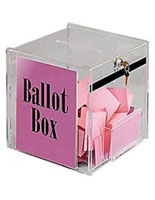 This acrylic ballot box, also called an entry box has a 5.75"w x .5"d top entry slot. 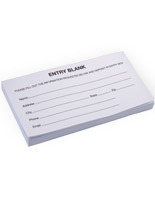 This extra wide opening is perfect for accepting entry forms, dollar bills and ballots. 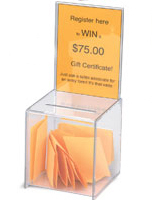 To empty this acrylic ballot box simply unlock the box and slide off the header. 9.1" x 20.5" x 20.0"
This box is very sturdy and made from thick plastic. It's a good size for our purposes (we're using it as a donation box in a museum) and the built-in header is a great addition. The only thing that I would change is to have screw holes in the bottom so that it could be fastened down somehow. It would be easy for someone to pick it up and steal it. Thank you so much for taking the time to write this review! 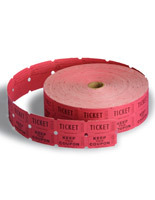 We're so happy that you found our ballot box to be well suited for collecting donations at your museum. We like your idea for bolting the ballot box to a countertop for security, and we'll certainly forward your feedback along to our product development team for review, and let you know if this feature becomes available. Thanks again! 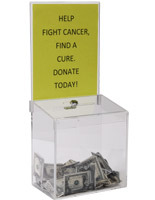 We recently used the BXCL85 Ballot box as a donation box for our organization. It worked great. The box is sturdy and easy to transport. The insert slot is wide enough for dollar bills, which had been a challenge with a previous box. It's a great product and I would recommend buying it. This is the exact size we were looking for. It fits our pedestal perfectly. Well built, sturdy enough for our purposes. Sounds like everything worked out perfectly, Andrew! Thanks for shopping with us and sending us your feedback -- we appreciate it!